Family Changes: Explaining Divorce to Children is a new book written by Azmaira Maker, PhD. As Founder of the Child-Centered Divorce Network, I am often sent new books for children about divorce. I always look forward to reading them, hoping they will have the tone, voice, message and visuals that convey what parents want their children to know and understand about their divorce. Sadly, I have been disappointed in most of the books I’ve received. That’s why I’m so excited to share with you this new book from psychologist Azmaira Maker. It helps young children understand what divorce means and how it will impact their lives. It’s hard for us, as grown-ups, to explain it to them in terms they can fully comprehend. Nonetheless, when a child is involved in a family divorce or separation, it is crucial that he or she understands and embraces the changes… and this book will help a parent explain the transitions to their child. 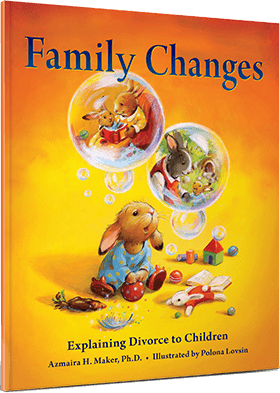 Family Changes is a delightfully informative children’s book that tackles a complicated topic in compassionate, child-friendly terms. Ideal for young minds aged four through eight, it features a colorful cast of fuzzy characters led by a young bunny named Zoey, who is struggling with her parents’ divorce and is riddled by important questions and feelings your child is likely to encounter. In addition to the heartfelt story at its core, Family Changes also offers parents, therapists, teachers, and caregivers valuable information on how to ease children through this significant life change. The book ends with a comprehensive note to parents and a list of essential child-focused questions to guide the adult and child. These excellent question are an asset to both children and adults involved in the divorce/separation process. I have written my own downloadable ebook on breaking the divorce news to children: How Do I Tell the Kids About the Divorce? A Create-a-Storybook Guide to Preparing Your Children — With Love! My ebook offers a personal customized approach. However, it focuses on children six and older and is not as well suited for younger children. 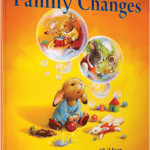 Family changes identifies and normalizes young children’s feelings, concerns, and questions about parental divorce. Feelings of sadness, anxiety, loss, confusion, and anger are highlighted for the child via safe adults, peers, and fantasy. 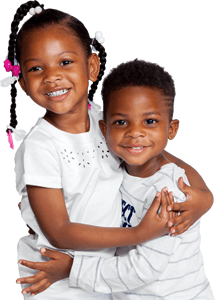 Family Changes also serves as a guideline for adults in terms of what to expect developmentally, emotionally, and cognitively from young children. 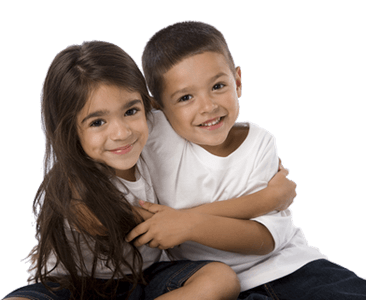 It provides adults with specific statements, questions, and content related to separation and divorce that facilitates a developmental and normative understanding of the child’s concerns and feelings. The purpose of the book is not to offer a magical solution or even resolution at the end of the story. Rather, the ending of the story suggests that understanding and coping with divorce is likely to be a longer-term developmental process, and not a one-time conversation. Family Changes: Explaining Divorce to Children, by Azmaira H. Maker, is a picture storybook that focuses on a non-traumatic separation and divorce between a heterosexual couple. 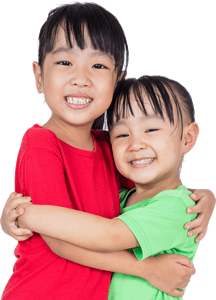 The content assists parents and other significant adults (grandparents, teachers, therapists, and caregivers) to process factual and emotional information with young children, ages 4-8 years. Family Changes: Explaining Divorce to Children is an award winning FINALIST in the 2015 USA Book News Best Books Awards. It has also won the 2015 Pinnacle Book Achievement Award. Learn more at www.AspiringFamilies.com, CreateSpace.com or at Amazon.com. Rosalind Sedacca, CLC is a Divorce & Parenting Coach, recognized as The Voice of Child-Centered Divorce. She is the founder of the Child-Centered Divorce Network which provides valuable resources for parents who are facing, moving through or transitioning after a divorce. She is also the author of How Do I Tell the Kids about the Divorce? A Create-a-Storybook Guide to Preparing Your Children – with Love! and co-host of Divorce, Dating & Empowered Living Radio Show & Podcast. For her free ebook on Post-Divorce Parenting, Coaching services and other valuable resources on divorce and parenting issues visit www.ChildCenteredDivorce.com. Moiety App is a Free Online Scheduling Tool That Supports Co-Parenting Success!